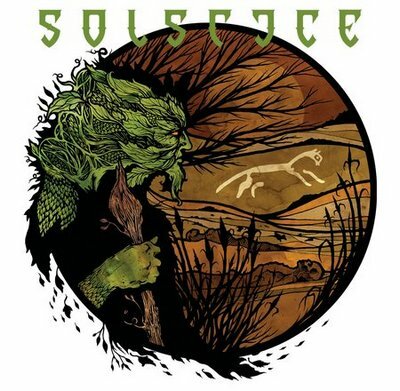 Solstice performs a very traditional form of doom metal. There is a definite dichotomy between the softer and heavier portions of the disc and this leads to a good amount of variety. The sound is indeed epic matching their epic doom metal tag and leads to a lot of huge moments. The sound is at times similar to Candlemass, but at others more slow and deliberate than that. They somewhat recall the likes of Atlantean Kodex and Pagan Altar as well, although this is more straightforward doom metal than either of those bands performs. The mixture of sounds leads to an eclectic album that remains interesting throughout the running length. It could be improved by adding more catchy doom moments to the disc and cutting out the parts that drag out for a long time. The band has the ability to channel the energy of classic doom metal into their spirits, but at the same time treading into epic territories that are new and highly desirable. The musicianship is solid with highly addictive guitar riffs being performed over a traditional sounding vocalist and solid drumming. Though it’s not the best doom metal I’ve heard, it is some of the best that has been released this year. The band could tighten up their sound a bit and get more of the epic doom moments take over for more success in the future. As it stands, this is a high quality release that is very reliable and consistent throughout. It makes for high rousing doom that has plenty of ups and downs. It is heavy, but not overly so and manages to make a severe impact on the listener. It is also a moody release that has plenty of emotion packed into its tracks. All in all, White Horse Hill is a very solid epic doom metal release that will be loved by fans of the sub genre.